Reading the Fantastic Four comics from the start. Issue #391 has a time travel within an alternate timeline and a fight against a tentacle monster. You know, the usual. The Watcher has teleported Sue, Ben and Johnny to alternate timeline where that version of the FF failed to stop Galactus the first time Galactus came to Earth. After explaining this, the Watcher then sent the heroes back in time to that timeline’s 1960s for a second chance at stopping Galactus, but without Reed this time. If you think this is confusing, try reading the actual comic. Meanwhile, the egg that Lyja laid is starting to hatch, just after she informed Johnny he is not really the father. If you think this recap is confusing, try reading the actual comics. We begin with FF and the alt-timeline Silver Surfer leading an all-out attack on Galactus. Their attacks have no effect, but the big G does take time to speechify about how he must devour the entire planet in order to survive. 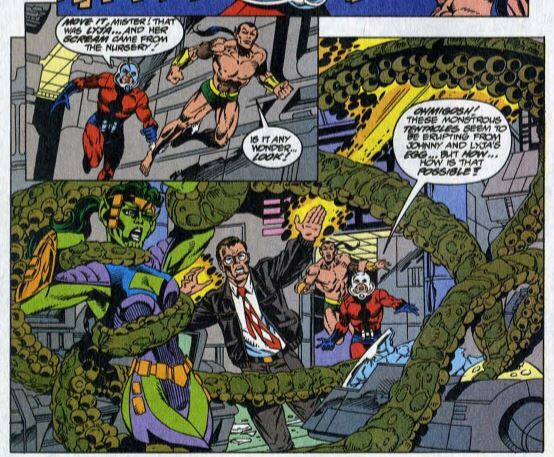 Back on “our” Earth new teammember Ant-Man and special guest star Namor the Sub-Mariner return from the alternate timeline to Four Freedoms Plaza, only to find Lyja and new character Rafael Suarez under attack by a giant tentacle monster. Suarez, you might remember, now has Lyja’s “Laserfist” implant, granting him laser-blastin’ super powers. 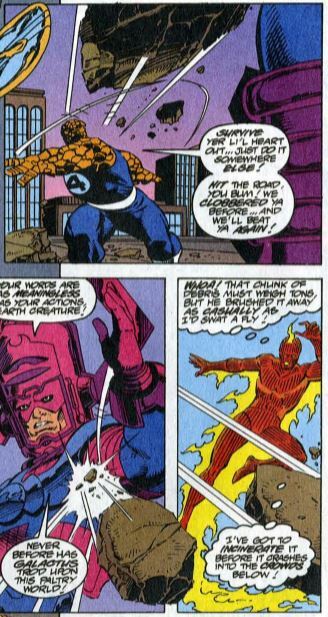 Then there’s a few more pages of the FF fighting Galactus, with Sue saying they’re only trying to distract him long enough for the alt-timeline Reed to return from Space. 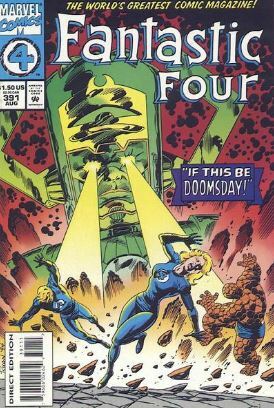 This gets us into the “What If?” part of the story, where in this timeline, Reed instead of Johnny was sent to space to collect the Ultimate Nullifier. While inside Galactus’ home, Reed becomes distracted by all the scientific wonders he sees there, with one almost blowing up in his face. Despite getting distracted, he insists that he must find the Nullifier soon. On Earth, Ant-Man shrinks to teeny size and flies into the egg, only to discover it is bigger on the inside. He manages to temporarily distract the creature, saving Lyja and Suarez, but this just makes the creature angrier, and it attacks again. During the fight with Galactus, things go pretty much the same as they did in the ‘60s, until Galactus flat-out murders the Silver Surfer. This unleashes a wave of cosmic power so great it forces the FF off the roof and into their building. Then we cut to the Black Panther, who is meeting with the Inhuman royal family. The Inhumans are currently on Earth, traveling incognito as circus performers. Black Panther introduces Vibraxas, a Wakandan teen who has developed super-powers. Black Panther wants the Inhumans’ help in locating the Fantastic Four, so the FF can help understand Vibraxas’ powers and maybe teach the rebellious kid a thing or two about how to behave. 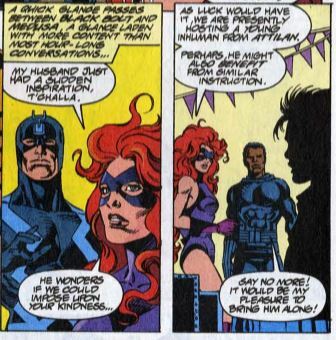 Medusa says they can’t help him, but the Inhumans have a similar problem, a troubled super-powered teen of their own. In the alternate timeline, the FF regroup inside the alt-Baxter Building. The Watcher reappears to give them a pep talk, saying that throughout all timelines, the FF have a history of beating the odds. He adds, however, that he refuses to tell them any more of his plan. Sue finds some ‘60s-era original FF uniforms and has the team wear them to replace the ones that got torn up in the fight. She, Sue and Johnny agree that they are likely to die when they attack Galactus again, saying that if this is to be the FF’s final battle, they will go down fighting. On Earth, Lyja kinda/sorta explains that the egg creature is a Skrull Sha’Barri. She further explains that Paibok the Power-Skrull implanted the creature inside her at her “weakest moment” hoping the creature would destroy the FF once the egg is hatched. Saying “This is personal” Lyja shape-changes into a second Sha’Barri and the two of them fight. In the other timeline, the FF attack Galactus, managing to distract him from building his world-devouring machine on the roof. Galactus turns Ben back into a human (why?) but Ben keeps fighting, only for Galactus to seemingly kill him. Galactus then seemingly kills Johnny. 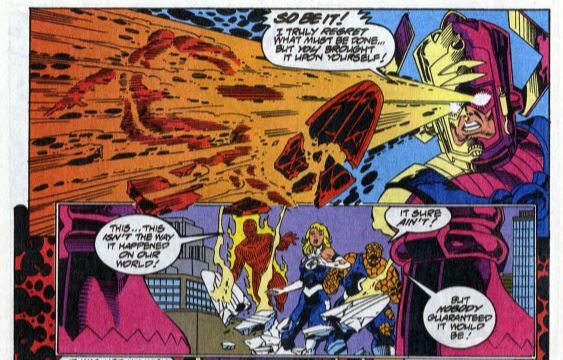 Sue goes all super-violent and throws a spear-shaped force field right through Galactus’ chest. This doesn’t bother Galactus in the slightest. He attacks Sue with such ferocity that she feels herself “catapulted” across multiple dimensions. She then sends out the “They’re all dead” message that we saw back in issue #378 that started all this. On Earth, Lyja has defeated the creature, and collapses from exhaustion. Ant-Man, Namor and Suarez then also see Sue’s message. Elsewhere we catch up to teenage Franklin and barbarian swordswoman Huntara flying around on their stolen time sled, when Franklin is hit by a powerful psychic premonition. He knows this means that Sue, Ben and Johnny are dead. Turn the page and we see Galactus standing over the dead FF in triumph. Unstable Molecule: Alt-Reed fears he may have activated Galactus’ device with his mind. Could this be a shout-out to issues #74-77 when Reed used his mind to contact Galactus in distant space. Fade out: Sue says she has always believed in the sanctity of life, except that Galactus pushed her to such extremes that she has no choice but to try to kill him. Clobberin’ time: It’s hard to tell, but it appears that when Ben is turned back into a human, he still has the scars on his face he got from Wolverine back in issue #374. Flame on: Johnny spends the issue wanting to get back to Lyja, and he says that if the team survives the fight with Galactus he plan on resigning from the FF. So they’re still foreshadowing an upcoming team break-up storyline. Fantastic fifth wheel: Namor refers to Ant-Man as “Scott” suggesting they have some familiarity thanks to all of Ant-Man’s time spent among the Avengers. Catching up with Medusa, she and the Inhuman royal family fled the moon after their battle with Ahura in Fantastic Four Unlimited #2. They got their new gig as circus performers in Namor #45. Medusa also had a cameo at the start of the Starblast crossover. Four and a half: When Franklin gets his psychic vision, his “Hound” scars temporarily reappear on his face, reminding us that his time-travel adventures also included the X-Men’s Days of Future Past apocalypse (or something like it). The Alicia problem: We don’t see the fight between Lyja and the Sha’Barri, but we’re told that Lyja had to go to a dark mental place to defeat it, and the others worry what affect this will have on her mind. Because she hasn’t been through enough already, I guess. 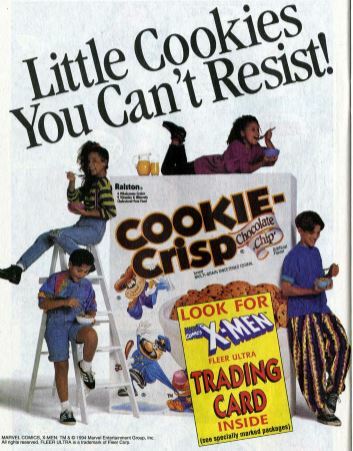 Commercial break: The X-Men were so huge at the time that Marvel put an X-Men ad right over this regular ad. Also, kid fashion. Trivia time: On the letters page, editor Ralph Macchio is not credited as editor, but as “Waste,” and assistant editor Matt Idelson is credited as “Assistant Waste.” The letters page is similarly lined with jokes (or not?) about the FF’s demise and how this is “the end.” I really wonder what goes in the Marvel offices sometimes. Fantastic or frightful? Having the main story take place in an alternate timeline makes the story feel low stakes. Sure, a world is in danger, but it’s not a world we know anything about. It’s a crisis in abstract, not an immediate crisis. It’s an improvement over the last few issues thanks to some extreme ’90s action, but there’s not much else to recommend.